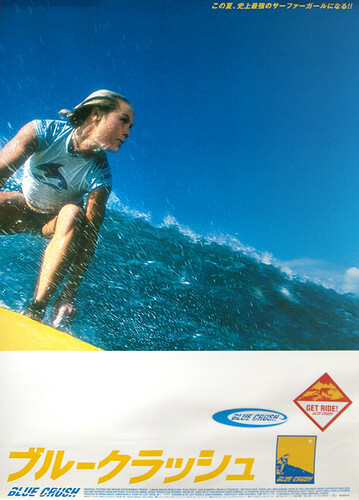 Blue Crush Special Japanese B1, originally uploaded by japanese-movie-posters. Probably only (Japanese) movie poster geeks will understand, but this poster is just unbelievable. 1) Different art from anything I’ve seen 2) B1 size 3) Definitely theatrical, as it has the Eirin mark 4) The oval and rectangles at the bottom right not only look like “surf brand” stickers, THEY ARE STICKERS, presumably meant to be taken off the poster and taken home?? Crazy. Not for sale at this point, sorry.